Man City And Inter To Spark Crazy Transfer Merry-Go-Round? 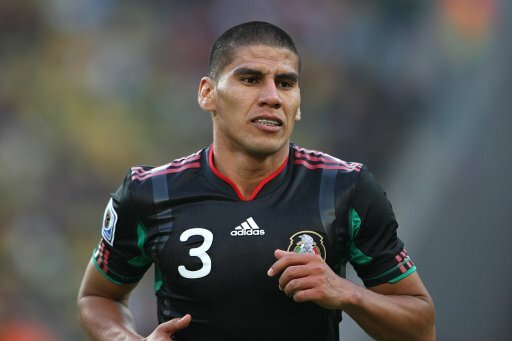 Liverpool Chasing Mexican World Cup Star? Rumour No. 1: It would seem that things are poised in such a way that Inter Milan striker Mario Balotelli‘s imminent £30 million move to Manchester City is going to spark a multi-player transfer merry-go-round. Inter will use the considerable windfall to fund a move for want-away Liverpool holding man Javier Mascherano (who has been told he can leave Anfield after holding talks with manager Roy Hodgson), a deal that may see Ghanaian midfielder Sulley Muntari moving the other way in part-exchange. The Nerazzurri will also attempt to lure Liverpool’s Dirk Kuyt and Atletico Madrid’s Diego Forlan to the Giuseppe Meazza over the remainder of the summer, whilst Balotelli’s arrival at Eastlands will see Emmanual Adebayor join Juventus on a season-long loan. Rumour No. 2: With the recent departures of Fabio Aurelio and Emiliano Insua, Liverpool are currently looking decidedly threadbare when it comes to options at left-back – an issue they plan to address with the £3 million signing of PSV’s Mexican international defender Carlos Salcido. Salcido impressed whilst on World Cup duty with El Tri and his Dutch employers are therefore keen to cash in on the 30-year-old, despite him having two years left to run on his contract at the club. The Best of the Rest: Manchester City have offered Aston Villa their £6-million-rated winger Shaun Wright-Phillips in a bid to secure the signing of James Milner. The Premier League board may intervene should Chelsea lodge a bid for Benfica midfielder Ramires, as the Brazilian international is part-owned by international super-scheister Kia Joorabchain. Arsenal are weighing up an offer from Osasuna for Manuel Almunia and, should the Spanish stopper rejoin his former club, may move for Cagliari ‘keeper Federico Marchetti as a replacement. West Ham have told Tottenham that they will have to stump up £15 million if they want to sign Scott Parker before the transfer window shuts. Fulham, Bolton, Sunderland, Cologne, Bayer Leverkusen, Sochaux and Genoa are all known to be trailing Portsmouth forward John Utaka. West Ham, Newcastle and Bolton have all made enquiries about Liverpool striker David N’Gog, but none are willing to meet the club’s £6 million asking price. Roma are stepping up their efforts to sign West Ham utility man Valon Behrami and are willing to include ‘keeper Doni and striker Stefano Okaka in the deal. Ajax, for some unfathomable reason, want to re-sign Mido from Middlesbrough.